What is the link with Craigellachie Hotel? Craigellachie’s distillery and hotel were both built by Alexander Edward, a local man of great enterprise and energy. The distillery came first; completed in 1891 when he was still only 25 years old. The handsome hotel, which was built in 1893, was designed to accommodate the growing numbers of visitors as the village became a late-Victorian hotspot. 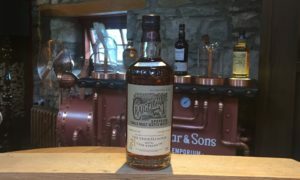 The hotel was restored several years ago and this bottling was released to celebrate the hotel being restored to its former glory, and the links between the distillery and hotel. What makes the Craigellachie Hotel bottling unique? This is a very limited run of just 510 bottles, with a uniquely sherried character not found within our standard Craigellachie range, is bottled at 57.2 % abv, natural cask strength, and is not chill-filtered. The Craigellachie Hotel bottling is exclusively available at the Dewar’s Aberfeldy Distillery whisky shop, retailing at £350 while stocks last. If you wish to purchase a bottle but are unable to visit us in Aberfeldy, just get in touch with via email on AberfeldyDistillery@Dewars.com. We currently only deliver to UK addresses.